Last December when Shilpa visited us, we were trying to remember if there were any recipesÂ that my mother prepared,Â which we have not posted on this site. While discussing this with my brother, he suggested this shrimp pickle. My aayi was a vegetarian, but she cooked nonveg for us. But they basically started making nonveg dishes at home after my marriage. I had heard my brother and father mentioning about this shrimp pickle many times. I had never tasted this before. I got the recipe from her and wrote it down in my diary. I have prepared this a couple of times. My brother has very fond memories of this pickle prepared by my aayi. This pickle is made with small shrimp. They are fried on a very low heat till they become hard and almost crispy. The pickle has basic pickle masala. 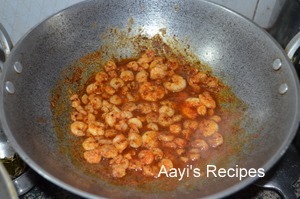 It remains good for few days if you take care to fry the shrimp properly. Eat it like any other pickle in small quantities, it tastes great with rice. 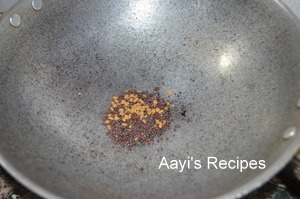 Heat oil and fry mustard, methi and asafoetida. Take them out in a mortar and powder them. Keep aside. 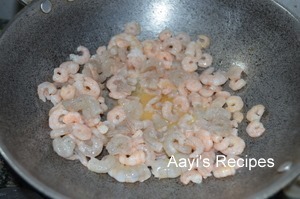 Heat oil and add shrimp. Let them fry on a low heat. Take care to make sure they don’t get burned and they get cooked through and almost become crispy. 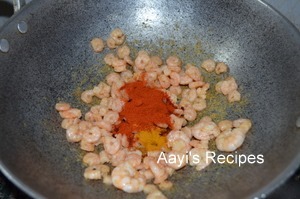 Now add chilli powder, turmeric, mustard-methi-asafoetida powder and tamarind. Add salt, a little bit more than you would add to any dish – salt acts as preservative. 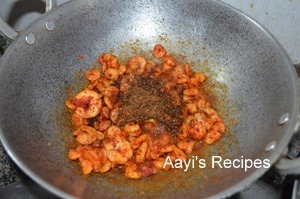 Cook on a medium heat till all the water from tamarind is well absorbed. something new and interesting! definitely worth trying! 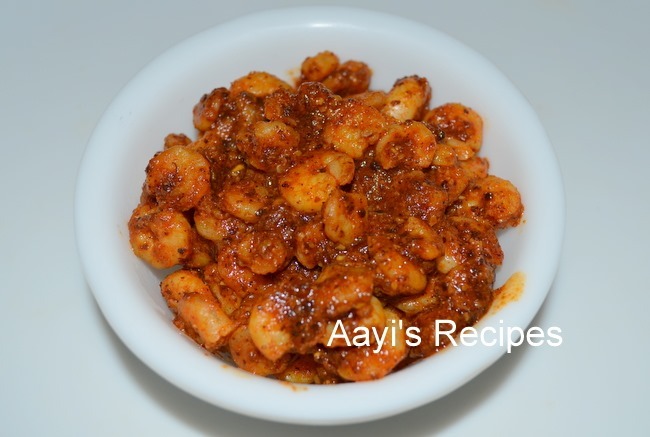 one of my favorite dish – I really never thought it is so easy to make! What a delicious mouthwatering looking picture. I am drooling just looking at it. :-o) Never tried making pickle before -definitely must try on my list. Thanks Aayi. Yes it does look mouthwaterng…great dish! OMG…do u use oil at all? I really admire ur cooking using very little oil most of the times….pickle looks sooper yummy…. Yummy. We can’t find asafoetida, though, hope it’ll be great without it! Thanx!